Through the laying on of his hands in the form of a Cross on his grandsons, Jacob gave a blessing to his descendants, foretelling at the same time their future until the coming of the “expectation of the nations” (Gen. 48). The Cross of the Lord was the instrument by which He saved the world after the fall into sin. Through the Cross, He descended with His soul into hades so as to raise up from it the souls who were awaiting Him. By the Cross, Christ opened the doors of paradise which had been closed after our first ancestors had been banished from it. The Cross was sanctified by the Body of Christ which was nailed to it when He gave Himself over to torments and death for the salvation of the world, and it itself was then filled with life-giving power. By the Cross on Golgotha, the prince of this world was cast out (John 12:31) and an end was put to his authority. The weapon by which he was crushed became the sign of Christ’s victory. The Cross is the unconquerable weapon of pious kings in the battle with enemies. Through the apparition of the Cross in the sky, the dominion of Emperor Constantine was confirmed and an end was put to the persecution against the Church. The apparition of the Cross in the sky in Jerusalem in the days of Constantius the Arian proclaimed the victory of Orthodoxy. By the power of the Cross of the Lord, Christian kings reign and will reign until Antichrist, barring his path to power and restraining lawlessness (St. John Chrysostom, Commentary on 11 Thes. 2:6-7). The “sign of the Son of Man” (Matt. 24:30), that is, the Cross, will appear in the sky in order to proclaim the end of the present world and the coming of the eternal Kingdom of the Son of God. Then all the tribes of the earth shall weep, because they loved the present age and its lusts, but all who have endured persecution for righteousness and called on the name of the Lord shall rejoice and be glad. The Cross then will save from eternal perdition all who conquered temptations by the Cross, who crucified their flesh with its passions and lusts, and took up their cross and followed their Christ. But those who hated the Cross of the Lord and did not engrave the Cross in their soul will perish forever. 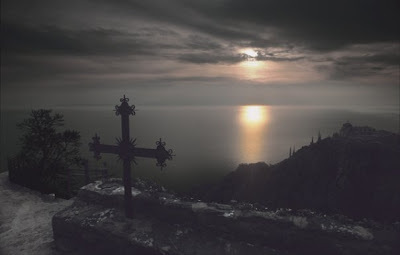 For “the Cross is the preserver of the whole universe, the Cross is the beauty of the Church, the Cross is the might of kings, the Cross is the confirmation of the faithful, the Cross is the glory of angels and the scourge of demons” (Octoechos: Exapostilarion, Monday Matins).